Understand the root causes of business problems faster. When a key performance indicator is off track, getting it fixed fast is paramount to achieving daily goals and long-term breakthrough performance. With the analytics capabilities of Dploy Solutions, you can quickly understand the specific factors contributing to a miss or a performance issue through drill down analysis. And you can leverage insights to resolve the root cause of problems, prevent them from affecting your performance in the future, and identify new approaches to driving greater profitability. It’s not enough to know a problem exists. Get down to the detail of why! The sooner you know you have a problem that’s standing in the way of meeting your business goals, the better it is for your business. But once you identify the issue, you still need to drill down to determine what’s driving the problem. Traditionally, this process is time and labor intensive and your business may not have the time and resources to spare. Automate and accelerate the process of understanding why performance problems occur. The analytics capabilities embedded in Dploy Solutions enable your business leaders to go beyond descriptive analytics (knowing that a problem occurred) and leverage the power of diagnostic analytics (why it happened?). 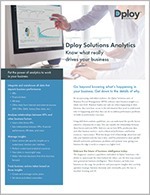 Dploy Solutions’ analytics capabilities works by identifying the key factors driving your operational KPIs and integrating the appropriate pieces of business and process data, both from internal and external sources, to deliver meaningful, actionable insights about the relationships between the factors. In manufacturing, for example, if you have a material variance, the analytics can quickly show you which line, which shift, and which machine parameters are contributing to the problem. Armed with this knowledge, you’ll be equipped to solve problems faster. Identify and explore new opportunities to improve your business. Beyond diving deeper into the KPIs that you already know impact your business, the enhanced analytics capabilities within Dploy give you the power to explore new opportunities to improve operations. You can quickly and easily run correlations and explore potential relationships between a wide range of business variables. These exploratory exercises can open the door to business insights that can dramatically enhance your performance and help you continue to identify and gather critical data that will give your business a sustainable edge. Prepare your business for a more profitable future. Optimize business performance by transforming the way you identify and resolve issues. With Dploy Solutions’ analytics, you’ll enhance your business today while paving the way to an even higher level of business insight and understanding tomorrow, including prescriptive analytics, cognitive analytics, machine learning, and AI. With Dploy Solutions, you’ll have the business knowledge you need to make better, faster decisions and keep your business at the top of its game well into the future. Know exactly what’s happening in your business—and why. As a cloud-based system, Dploy Solutions puts performance insights and action plans in context and makes them available 24/7 whenever and wherever you work. It aggregates essential data from the often-disparate business systems you already use, and enables analysis of relationships between those data, making information available and accessible in meaningful graphics and reports, in alerts, and on mobile devices. You get complete transparency into what’s happening in your business right now, along with past performance trends. With Dploy Solutions, you know what, when, where, and why issues are happening and what the impact is to your business. And you know what actions are in place to keep your business moving forward. See how Dploy Solutions can promote better decision making, faster execution, and improved operational excellence in your unique business environment. Please fill out the form to request your live demo today. I would like to sign-up to receive emails from Dploy Solutions. I understand that I can opt-out at any time.